Lucy: Last week I was observing a Summer Mountain Leader Training course with Graham Uney in the Lake District. This was a thrilling opportunity for me, to watch an experienced ML trainer at work, pick up some navigation coaching tips, and excitingly, it was also a bit of an extended job interview. Ever since I passed my own Summer ML eons ago, my life has been defined by my work in the mountains. I’ve been inspired by the excellent training and support that I received at the time and have been waiting for an opportunity like this to become involved with training future mountain leaders. Graham runs Graham Uney Mountaineering, based at Bampton near Shap, but ranging all over Snowdonia and Scotland too. We’d never met before but in the small pond of outdoor instructors in the UK he’s a well known figure. He was joined by Charlie, who is working towards his Course Directorship for ML awards, having worked on a number of courses around the UK and who runs his own company Your Mountain Challenge. The Mountain Leader Training course follows the syllabus as set out by Mountain Training, and although it isn’t possible to cover every minute aspect of the syllabus in six days, a huge amount is covered, plus the core skills of navigation, leadership and dealing with summer mountain hazards are trained in depth. Candidates should have accrued a minimum of 20 Quality Mountain Days before training, giving them the prerequisite experience needed to get the most out of the course. On Day 1, after some time spent in the classroom looking at the syllabus and scope of the award, we headed out on to the hill to practice some basic navigation skills. Most of this was easy revision for the candidates, and it was great for me to observe Graham using his methodical approach to teaching about the compass and map. As navigation coaches, we all have our little tricks up our sleeve, and we are always happy to borrow other people’s ideas! Day 1 was also a good time to introduce the responsibilities of the leader, and how to manage a group in the hills and around common hazards such as short rocky steps. We were blessed with the failing light of November and even managed to squeeze a bit of “night nav” in before tea. Day 2 was a magnificent day to be in the hills so we headed to the big mountains for a circuit of Striding Edge and Swirral Edge and the summit of Helvellyn. This is a classic Lakeland route, but quite serious in places and taking the Mountain Leader in to the”grey area” where a rope may be required in certain situations. It was a good opportunity to discuss a range of thorny issues, such as use of the rope (it’s a tool for emergencies only for MLs), the scope of the award, and managing groups in hazardous terrain. As a quality mountain day it had a bit of everything, including some navigation, despite the excellent visibility. Graham is one of the Fell Top Assessors for Helvellyn in winter, so knows the mountain like the back of his hand. It was pretty cool to be up there with him! On Day 3 we headed to Mardale to look at steep ground hazards. On the way, Graham let me loose with his precious candidates and I spent some time with them looking at contour interpretation. We navigated our way up to a boulder field where Graham demoed some emergency rope work before the candidates practised using different types of anchors and body belaying for themselves. Finally, they tried out “Classic” and “South African” emergency abseils. Fun/scary (delete as appropriate) under friendly conditions, useful to remember if an unforeseen problem arises. Day 4 was a nuts and bolts kind of a day, including emergency procedures, and confidence roping. The weather was pretty brutal so we were happy not to wander too far from base, and even to spend some time in the classroom. 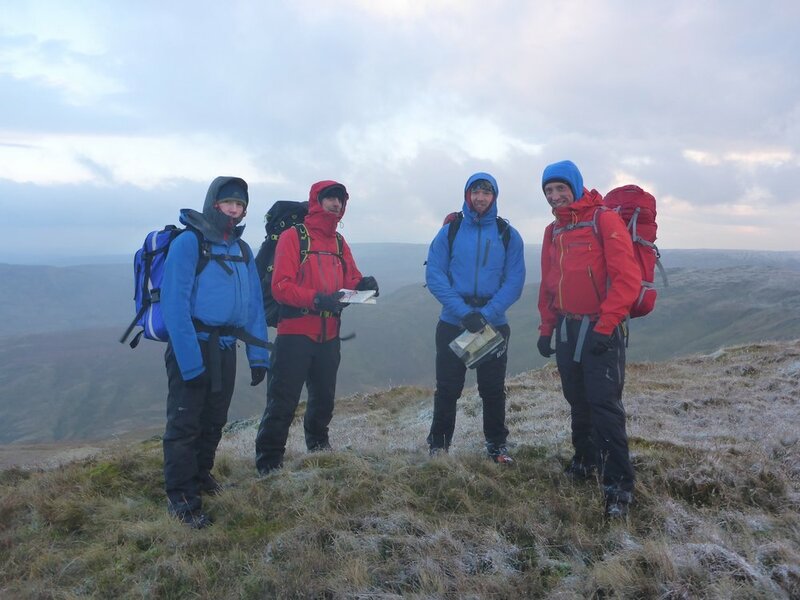 The final two days of a Mountain leader Training Course usually contain the expedition element. This involves a night out camping, and some night navigation. Last week the weather was very cold, and windy, and with fresh snow high up later in the week, we headed to a relatively low lying area (600m or so) and planned a camp not too far from Mosedale Bothy. Bothies are not for use by organised and commercial groups, but it was good to know that shelter was nearby for the team should the weather become a serious problem. On the first day of the exped we did experience quite a bit of sideways sleet and even snow, but by the time we got down to the valley floor conditions had calmed, and after a hot tea, we headed out again in to a starlit night for night navigation practice. This aspect of the ML syllabus often intimidates candidates (it did me) but these days I see it as a huge adventure. I love being out at night and navigation is a fun challenge. The key is to be methodical in your approach, keep your navigation legs short and use good strategies. Also chocolate and a hot drink help! After a cold night, we headed out for a final mission, back to the car park… with lots of navigation in complex terrain, building up to assessment conditions. The candidates were able to put all that they had learned in to practice, completing a two day mountain journey during which our feet barely touched a mapped path. A huge well done to everyone on the course, it’s a full on experience, totally immersive, and a big milestone on their journey to becoming mountain leaders. It was also a fantastic learning experience for me. I’m hugely grateful to Graham and Charlie for sharing their knowledge and experience with me, and to the candidates themselves who were great fun and super keen. I loved being part of Graham’s team. Training future leaders is where it is at for me in terms of job satisfaction, and I’m delighted that 2019 is looking to contain lots more of this sort of stuff. Excitingly, there will even be a Summer ML running over split weekends in the Lake District and on Arran!